I’m giving a talk at McGill this Friday. ‘If you build it, they will come’? Friday, April 4, 2014. 4-5:30pm. Centre for East Asian Research. McGill University, Montreal. 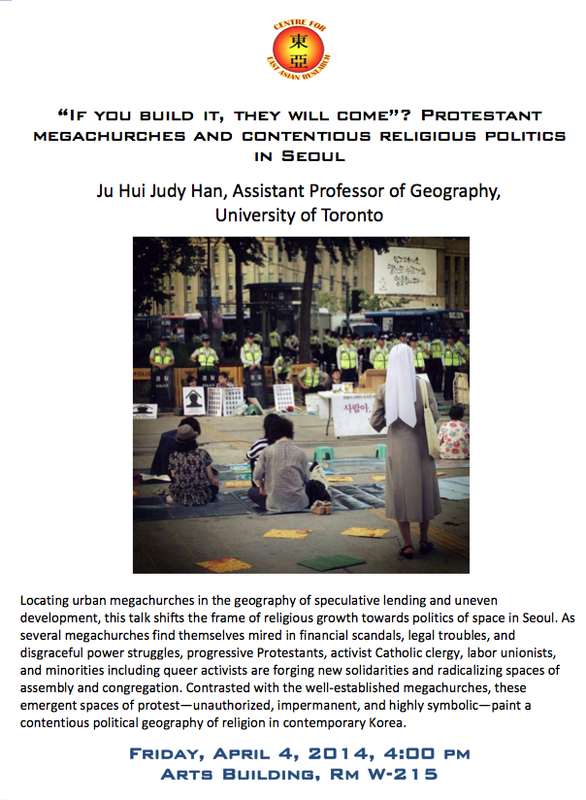 Locating urban megachurches in the geography of speculative lending and uneven development, this talk shifts the frame of religious growth towards politics of space in Seoul. As several megachurches find themselves mired in financial scandals, legal troubles, and disgraceful power struggles, progressive Protestants, activist Catholic clergy, labor unionists, and minorities including queer activists are forging new solidarities and radicalizing spaces of assembly and congregation. Contrasted with the well-established megachurches, these emergent spaces of protest—unauthorized, impermanent, and highly symbolic—paint a contentious political geography of religion in contemporary Korea.